Long before she ran away with Paris to Troy, Helen of Sparta was haunted by nightmares of a burning city under siege. These dreams foretold impending war—a war that only Helen has the power to avert. To do so, she must defy her family and betray her betrothed by fleeing the palace in the dead of night. In need of protection, she finds shelter and comfort in the arms of Theseus, son of Poseidon. With Theseus at her side, she believes she can escape her destiny. But at every turn, new dangers—violence, betrayal, extortion, threat of war—thwart Helen’s plans and bar her path. Still, she refuses to bend to the will of the gods. A new take on an ancient myth, Helen of Sparta is the story of one woman determined to decide her own fate. I suppose it's only right to confess that I've never liked Helen of Troy. I'm not sure why, but as a character she's never interested me so it should come as no surprise that content was not a huge factor in my decision to read Amalia Carosella's Helen of Sparta. To be honest, my interest in the book was sparked by author Stephanie Thornton. Weeks before Helen of Sparta was available, Thornton made her enthusiasm for the book known via Facebook. For one reason or another, the glowing remark lodged itself in my memory and ultimately motivated my procurement of Carosella's debut. Lucky for me, Thornton's assessment was spot on. Carosella put my skepticism to rest in only a few pages and I quickly found her work all but impossible to put down. Her depiction of Helen has a fire and intensity I'd never seen attempted, but the way she balanced that drive against soft emotions and feminine gentility brought a fascinating degree of depth to Zeus and Leda's daughter. I was equally intrigued by Carosella's decision to begin Helen's story long before Paris laid eyes on her famed beauty. In shifting focus to Helen's association with Theseus, Carosella brought Helen's history into perspective and challenged readers view her character in a wonderfully refreshing context. Carosella's depiction of Theseus was also very dynamic and I was deeply impressed with how his relationship with Helen was handled over the course of the story. He is much older than his leading lady and far more experienced in both love and politics. There is a maturity about him that contrasts Helen's youth and that really appealed to me. The book is character heavy and I'll admit Carosella covers a lot of mythological material, but I was never overwhelmed by her presentation and was quite pleased with how she brought the various elements of the story together. I thought the book very well-researched and appreciated how the narrative complimented both familiar and lesser known Greek legends. 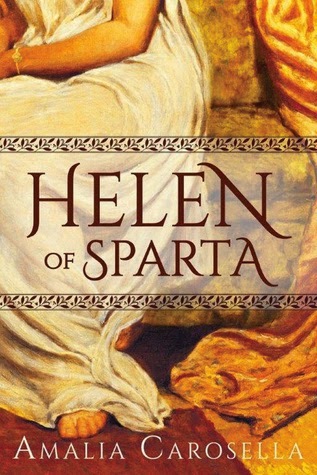 Helen of Sparta is an ambitious novel and I understand that many may find its length intimidating, but I found the book nothing short of brilliant and would easily recommend it alongside Bradley's The Firebrand and Fortier's The Lost Sisterhood.